Given that you are watching this video you’ve probably heard the term “offset account” thrown around. It’s a home loan feature that will bring down the interest you pay and save you big bucks. But what exactly is it and how does it work? A mortgage offset account is just like your everyday bank account, except its linked to your home loan. When you open your offset account, you will receive a debit card from your lender, which you can use to make everyday purchases. You can also have your salary deposited straight into the account and you can set up direct debits for any bills. Simple right? Well that’s what an offset account is, but how does it work to bring down the interest that you pay on your home loan? Well the answer, is that the balance in your account is offset everyday against the home loan principal. Let’s use an example to demonstrate how this works. If Lisa has a $500,000 home loan and $50,000 in an offset account, she will only be charged interest on the difference - $450,000. And say Lisa’s interest rate is 5% and she maintains that balance in her offset account over a 30-year term, she will be saving around $142,000 in interest and she will pay off her home loan more than 4 years early. Now think of all that you could do with that sort of extra cash. A well-deserved trip around the world perhaps? So, an offset account, in a nutshell, is just like your everyday bank account but the balance is actually working for you by slashing the interest that you pay and helping you to pay off your loan much faster. Want the flexibility of an offset account? Compare over 450 home loans today at Mozo.com.au. One of the more popular features when it comes to bringing down the interest you pay is an offset account - but what exactly is a mortgage offset? In this guide we’ll explain the ins and outs of an offset account, so you can decide whether it’s right for you. What is a mortgage offset? An offset account is just like an everyday bank account, except it is linked to your home loan. You can get your salary deposited into the account and set up direct debits for any bills. When you open your offset account you will receive a debit card from your home loan lender, which you can use to make everyday purchases. The major benefit of using an offset account is the balance will offset daily against the home loan principal, bringing down the amount of interest you pay. For instance, if homeowner Lisa has a $500,000 home loan and $50,000 in an 100% offset account she will only be charged interest on $450,000. How much can an offset account save me? Big bucks! An offset account with a considerable balance will not only reduce the amount of interest you pay but the length of the term as well. Let’s use the same home loan scenario as above. Over a 30 year term with a 5% interest rate, if Lisa maintained a balance of $50,000 in her offset account over the life of the loan she will save around $142,000 in interest and pay off her loan 4 years and 4 months earlier. What home loans come with an offset account? Generally only variable rate loans come with the option of a 100% offset account. However, some split loans, which fix a portion of your loan and leave the remainder variable allow you to have an offset account that will reduce the amount on the variable portion. For instance, say Lisa decides to fix $200,000 of her home loan and leave $300,000 variable, on the variable portion because she has $50,000 in an offset account she will only be charged interest on $250,000. Offset account and extra repayment facilities are both great options for bringing down the principal of your loan, whilst allowing you to draw on that amount later on. But there are plenty of other features out there that provide great flexibility. From repayment holidays to home loan top ups, read our in depth guide on the features available in the home loan world. Does it cost extra to have an offset account? Yes many home loans that come with an offset account facility charge a higher monthly service fee, compared to no frills home loans that may come with no monthly fee at all. You could also be charged a steeper interest rate, especially if you’re signing up with a full feature home loan that comes with a range of other flexible features like fee free extra repayments, a redraw facility and home loan portability. What are the other benefits of an offset account? It’s tax free, as the savings you make through reducing the amount of interest you pay on your loan are not classified as income. Keep in mind when you’re comparing home loans that there is a difference between a partial offset account and a 100% offset account. Portion of your balance. Your provider may offset a percentage of the balance in your offset account to reduce the principal of your loan and the interest you pay. For example, if Lisa signs up with a loan with a 40% partial offset facility, $20,000 of her $50,000 balance will go towards bringing down the principal. So on a $500,000 home loan, she would only pay interest on $480,000. Discounted rate. Another type of partial offset you may be offered is a discounted interest rate on the balance in your offset account. For instance, a home loan with a 5% interest rate that offers a 1.5% discount will mean you will only be charged 3.5% on the balance in the offset account. As the name suggests 100% of the balance in your account will be offset against your home loan. So as mentioned above with Lisa’s scenario the full $50,000 will be offset against her $500,000 home loan amount and she will only pay interest on $450,000. 1. 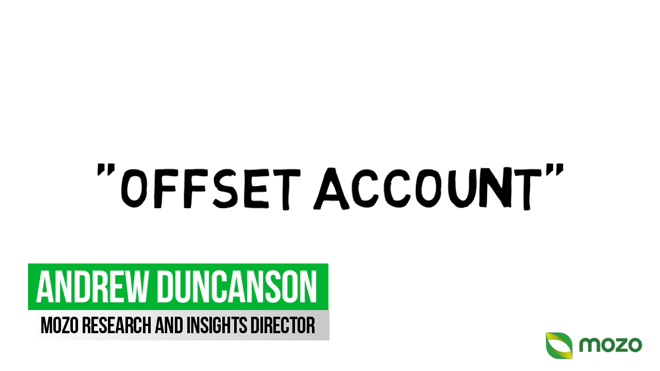 Replace your bank account with your offset account. There’s no point signing up with a home loan that charges a higher interest rate and monthly fee if you’re not going to use the feature. So make sure you replace your everyday bank / savings accounts with your new offset account, so that you’re getting the most value from the facility. 2. Get your salary deposited into the account. The best way to reduce the interest on your home loan is to have as much money in the offset account as possible, as your balance will be offset daily. So your first call of action when you set up your offset account should be to contact your employer/s to give them the details of your account. 3. Pay for everyday purchases with a credit card. Consider paying for all your expenses via a credit card to ensure you have the highest possible amount in your offset account at all times. Of course this tactic is only if you know you won’t be tempted to spend out of your means and can pay your credit card balance in full each month.